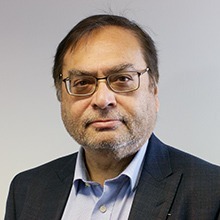 In addition to significant Voluntary Sector board experience, Anil is also a highly experienced professional executive with over 25+ years’ international experience of delivering major transformational change (Technology, Business, Culture, and organisational) within different industry sectors – Financial Services, Defense, Banking, Utilities, Consumer Products and Transportations. Anil’s global business experience includes significant expertise around global leadership, technology, outsourcing and business transformation through use of technology. He is a highly experienced professional executive with 30 years’ international experience of delivering major transformational change (Technology, Business, Culture and organizational) within numerous different industry sectors and across different countries. He has significant Board Level experience of governance, strategic management, working with senior executive, influencing stakeholders and contributing to overall wellbeing of the organizations and their future sustainability. In addition to being the Chair of Voluntary Action LeicesterShire, he is also a Governor at Coventry University, Non-Executive Director for Coventry University Colleges Ltd, and Serious Games International Ltd, Trustee of Dre Montfort University Student Union, member of Governance Committee, Science Council and a Board Member of the Leicester & Leicestershire Enterprise Partnership (LLEP). He is a Fellow of the Chartered Institute of Management, a Chartered Engineer, Fellow of BCS, The Chartered Institute for IT, and a member of the Institute of Directors.